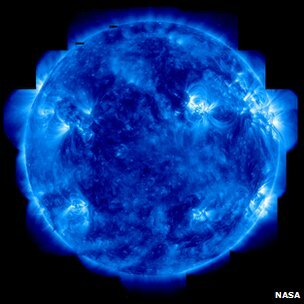 An influence of solar irradiance variations on Earth’s surface climate has been suggested as the mechanism which causes (and has caused) climatic variability in the Northern Hemisphere, notably the recent spell of cold winters (and also could have accounted for the Little Ice Age. The latest satellite data shows the UV output is far more changeable than scientists had previously thought. A UK scientific team now shows in Nature Geoscience journal how these changes lead to warmer winters in some places and colder winters in others. The researchers emphasise there is no impact on global warming.